Find out how to efficiently uninstall Popcorn Time app from Mac in order to avoid the adware problems that may co-occur with its appearance on the box. 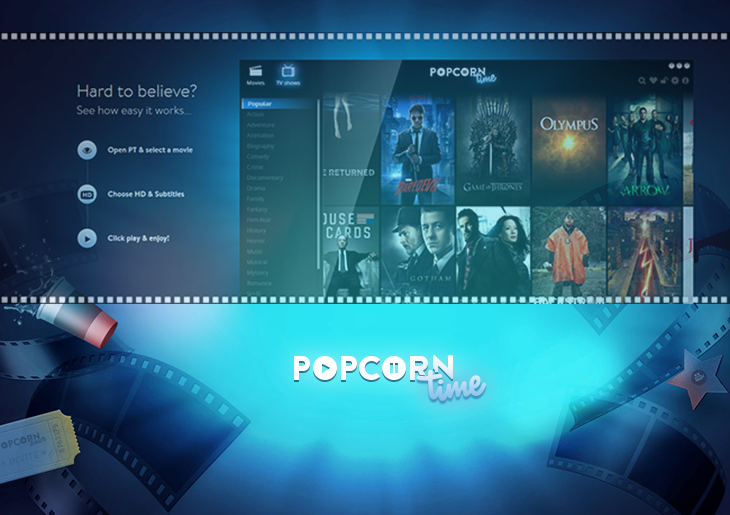 The whole existence of Popcorn Time project has been accompanied by controversies, conspiracy theories and detective-style rumors. This open-source app formerly hosted on popcorntime.io has been bringing tons of trending video content to the masses, the content that people could hardly find elsewhere for free. Naturally, big players on the multimedia arena haven’t been happy with this state of affairs, to say the least, and they’ve got quite fair arguments to be that dissatisfied: the competing application doesn't charge its clients a penny and, effectively, it is illegal. The breaking news of the last week was the shutdown of this service. It’s not clear at this point whether this nontrivial event is an outcome of legal confrontation or an argument between the product’s developers, but the fact is the site isn’t functional and the app no longer works on user’s machines. This shutdown has, predictably enough, called forth a spike in the installations of copycat applications, including Butter and the utility distributed on popcorn-time.se. Whereas the former is believed to be secure, the latter counterpart reportedly promotes adware and other Mac infections. The more recent reincarnation of Popcorn Time, therefore, is a potential security problem that users are bound to deal with. When installed, this variant of the program is likely to hijack the clients’ web browsers, serve superfluous ads on websites and even lead to identity theft. More specifically, Mac users may start encountering issues like unauthorized modification of browser preferences, which results in redirects of web traffic to junk search engines and ecommerce sites. In addition to that, a virtual layer can be added to Safari, Chrome and Firefox on the infected Mac, leading to an influx of comparison shopping sections, coupons, banners and in-text ads injected into pages. The drive-by infections delivered along with Popcorn Time can as well trigger transitional windows that randomly pop up and slow down the browser. Adware is also generally known to track its victim’s web surfing history, which isn’t good news for anyone affected either. To cap it all, the software itself may impact the Mac’s productivity and render the system unstable. If these or similar security issues have commenced after the Popcorn Time applet was installed on a Mac machine, it’s high time this software got removed. This process needs to be thorough enough for no fragments of the unsafe components to remain, so be sure to follow instructions that guarantee in-depth detection and eradication of malicious code. When confronted with malicious code like the Popcorn Time on Mac, you can neutralize its toxic impact by leveraging a specially crafted system utility. The Freshmac application (read review) is a perfect match for this purpose as it delivers essential security features along with must-have modules for Mac optimization. This tool cleans unneeded applications and persistent malware in one click. It also protects your privacy by eliminating tracking cookies, frees up disk space, and manages startup apps to decrease boot time. On top of that, it boasts 24/7 tech support. The following steps will walk you through automatic removal of the Popcorn Time infection. 4. Check whether the Popcorn Time virus has been fixed. If the lock screen is still there, go to the Uninstaller option on Freshmac GUI. Locate an entry that appears suspicious, select it and click Fix Safely button to force-uninstall the unwanted application. 5. Go to Temp and Startup Apps panes on the interface and have all redundant or suspicious items eliminated as well. The Popcorn Time fraud shouldn’t be causing any further trouble.